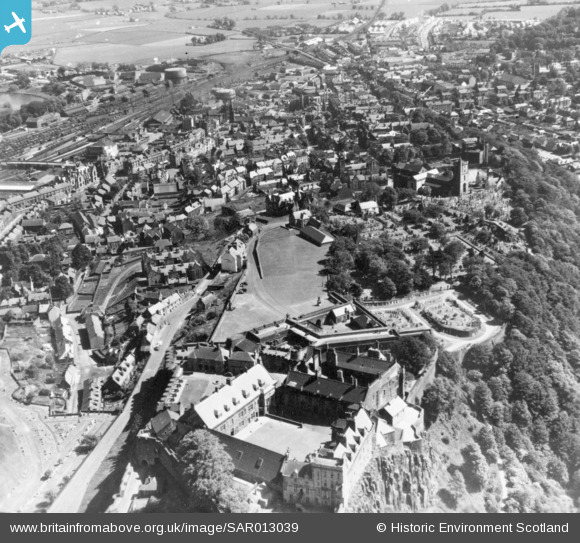 SAR013039 SCOTLAND (1950). Stirling Castle and town Stirling, Stirlingshire, Scotland. An oblique aerial photograph taken facing South/East. Title [SAR013039] Stirling Castle and town Stirling, Stirlingshire, Scotland. An oblique aerial photograph taken facing South/East. Site of Forthbank Park, home of Kings Park FC, Stirling's pre-war Scottish League team. The grandstand was struck by a Luftwaffe bomb in July 1940,the club shut down shortly after though continued as a legal entity until the War Office paid compensation for the damage in 1953.